Tiberian Eclipse is being designed to improve upon the concepts of C&C4, and bring it to the gritty atmosphere of the C&C3 engine. Improved gameplay, new features, and an evolution between Westwood’s & EA’s concept of Tiberium will be presented. Experience the return of some of your favourite units, evolution of others, and entire new ones in what we hope will come together to make a great conclusion of the C&C: Tiberium Series. 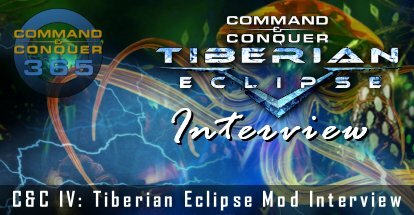 Dbjs2009 recently had this interview with coolness7, director and the leader of the C&C IV Tiberian Eclipse Dev Team who creating this ambitious mod. Please tell us something about yourself and about your mod team? I’m Damien, aka, Coolness7, aka, Naraku and I like Strategy games, Call of Duty, Need For Speed. I own a ps3 and I’m not as addicted to Starcraft 2 as some of the other people on the mod. The mod team does their best and even though there are about 20 of us, only about 6-10 of us get online at the same time (usually). Jay is the project coordinator and he runs the website, he’s very helpful when he’s not PO’d about something, and out of all of our team, everyone wants to do the story-writing, the team really comes up with great ideas and its a shame that we can’t use them all. As we all know you’ve made a great start with your mod so can you please tell us something about it? This mod started out as an idea to bring classic gameplay to C&C4, but since a C&C4 SDK was never released and probably never will be, we decided to move the project over to C&C3. At first we all put together our ideas and we didn’t have the experience to put the plan into motion, but as time went on, we got support and more great team members. This mod plans to bring the C&C4 class system into C&C3 and fuse it with traditional gameplay that we wanted to see in C&C4. What makes your mod so special and so great like this? This mod is not really the first of its kind because there have been many similar ideas, but so far we are the only, (or most successful) mod to fuse the new gameplay of C&C4 with the traditional C&C3 and TS. We have attracted many fans because we want a continuation of C&C3 that fills in the gaps because, as you may know, C&C4 jumps far into the future and really leaves behind alot of questions that we intend to answer. What are the main goals for this mod? One of the main goals of this mod is to bring the concepts of EA and WW and to fuse them together, because mods before this have shifted towards one side or the other, wanting to make TS more like C&C3 or making C&C3 more like TS. We also want to introduce new canon into the C&C universe with an all-new campaign. Earlier in development we intended to go with the C&C4 storyline, but now we plan to do something completely different, in the end, the campaign may end up looking more like TS: Firestorm than C&C3. Also, we want to bring new characters and game elements into the fold that are exclusive to this mod, we will be revealing some of those later in development. Do you have any future plans for your mod? Are you planing to make another special mod? After the 1st release, which will only include the GDI and Nod multiplayer factions with a few prologue missions, we plan to create a long and immersive campaign which we hope will give the big bang that C&C always needed. The campaign will be divided into two parts, pre-incursion and incursion, and they will be two separate releases, we also plan to bring 3 new factions into the mod that were not highlighted in C&C4, they are: the Scrin, the Forgotten, and the IDC. We all know that the mod is not finished yet but when the whole thing is done, will you make another special mod? If/when this one becomes successful, I may make another mod, but it would be for the next C&C game. How did you get the idea to make this mod, you know from C&C 4 to C&C 3 the units, the maps, the buildings and the black zones right now, So how did it all start? The mod was devised by several people and we all just brought ideas together until we got something concrete, right now we have divisions of who works on what, so a small group works on black zones, another group works on units, and another group works on. Also, we have gathered some information on things that WW planned for C&C and also some things that EA wanted to bring into C&C4 but did not have the time or money to be able to do so. It all started with a thread on the official C&C forums, the thread died a few weeks later and I necroed it because I liked it, then bam, the whole thing just took off. Have you faced any problems within the team or the mod itself? Actually, we have faced quite a few difficulties, one of which is finding out how much is possible with the SAGE engine, whether we can make energy shields work or not and whether we can make the crawler concept work properly. We’ve had a lot of difficulties but we are working through them because this mod is more than just a mod, but an attempt to give C&C the spotlight it deserves. Are you working on a new mod or an update now? What does the community mean to you? The community is a tight one because people that play a C&C game come to love the series for what it is, and that is something you don’t get with COD, or NFS because those games don’t create a “universe”. Do you think that C&C 4 is the final chapter or there’s another C&C coming in the future? One of the things that surprised me is that at some point in one of the EA Dev interviews they said, “just because its the last game with Kane, doesn’t mean it’s the last game of the Tiberium universe. Which C&C game do you like the most? And why? Is there is any thing you want to tell the community and all the C&C fans around the world? Don’t give up on C&C, if EA is going through the trouble of replacing the development team then that means that they care about the franchise, I’m sure they are aware of the fact that C&C4 drove away some of the classic old-time fans.